Zaporizhia, The [Запоріжжя; Zaporižžja]. The name of the military and political organization of the Ukrainian Cossacks and of their autonomous territory (approx 80,000 sq km) in Southern Ukraine from the mid-16th century to 1775. The name was derived from the territory's location ‘beyond the Rapids’ (za porohamy) (see Dnipro Rapids). Its center was the Zaporozhian Sich. The Zaporizhia's territory—the ‘Liberties of the [Cossack] Host beyond the Rapids’—was situated to the south and east of Polish-ruled Right-Bank Ukraine, from which it was separated by the Boh River, its tributaries the Syniukha River and the Velykyi Vys River, and the Tiasmyn River, a tributary of the Dnipro River. To the northeast it bordered on the Left-Bank Ukraine's Hetman state along the Dnipro River and its tributary, the Orel River. To the east it was separated from Russian-ruled Slobidska Ukraine by the Donets River. To the southeast it bordered on the lands of the Don Cossacks along the Kalmiius River. The Zaporizhia extended southward deep into the steppe, where it bordered on the Crimean Khanate and reached, between the Berda River and the Kalmiius River, the Sea of Azov. The Cossacks gained renown in the late 15th century as defenders of the Lithuanian-Ruthenian state against the Crimean Tatars, while serving the Cherkasy and Kaniv starostas and living as free brigands in the uncolonized steppe frontier of the Polish state. The rise of the Zaporizhia resulted from the increasing colonization of that frontier by Ukrainians fleeing serfdom and other Polish-Lithuanian oppression. There they established homesteads and, to defend themselves from Tatar raids, built fortified camps (sichi), which were later united to create a central fortress, the Zaporozhian Sich, under the leadership of Dmytro Vyshnevetsky on Mala Khortytsia Island (ca 1552). 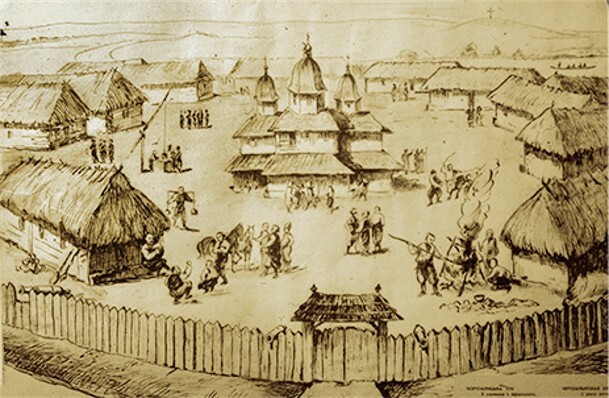 The anti-Polish Cossack rebellions of the 1590s, 1620s, and 1630s originated in the Zaporizhia and resulted in the growth of the military and political strength of the Zaporozhian Host. The Zaporizhia played a key role in the early period of the Cossack-Polish War of 1648–57. 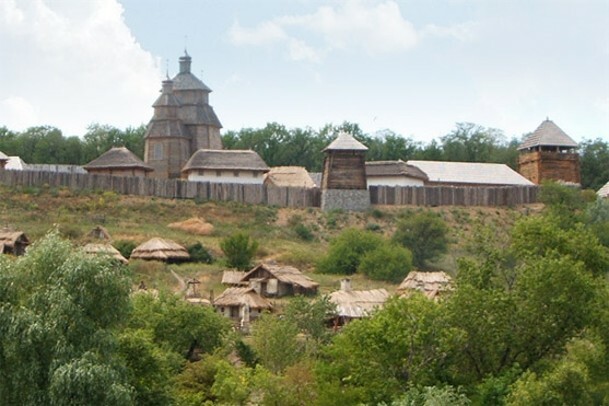 During the following period, of the so-called Ruin, it influenced the course of events, if at times only negatively, particularly during the hetmancy of Ivan Briukhovetsky and when Ivan Sirko was the Zaporozhian otaman (1660–80). The politically unsophisticated Zaporozhian leaders were often exploited by Muscovy and Ottoman Turkey and the Crimean Khanate, which succeeded in pitting the Zaporizhia against the Hetman state. With the Eternal Peace of 1686 the Zaporizhia became a Muscovite protectorate; it retained its autonomy while recognizing the authority of the hetman. 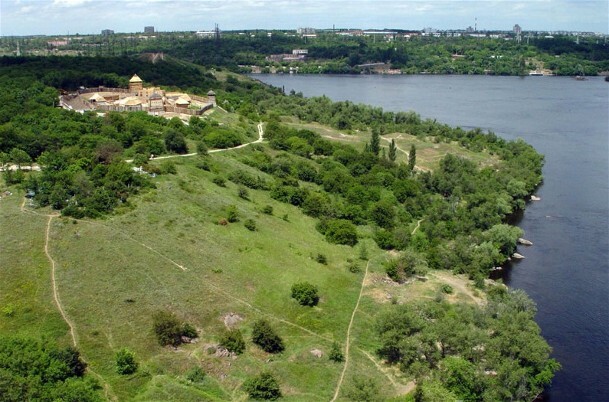 Soon Russian armed forces appeared in the Zaporizhia, and with time they established their own forts to control the Cossacks, notably a fort 2 km from the New Sich (1735). Under Otaman Kost Hordiienko the Zaporizhia became an ally of Hetman Ivan Mazepa and Charles XII in 1709. 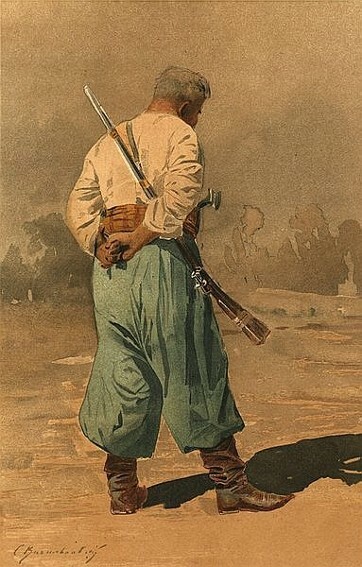 In retaliation Russian forces destroyed the Chortomlyk Sich and, after their victory at the Battle of Poltava, mercilessly persecuted the Zaporozhians, thereby forcing them to flee to Crimean Tatar territory, where the Zaporozhians founded the new Oleshky Sich. After Hordiienko's death in 1734, the Zaporozhians, having fared badly under the Tatars and not having their ranks replenished with new refugees from Ukraine, once again accepted Russian suzerainty and returned to their former lands. Thenceforth the Zaporizhia and the New Sich were directly under the control of the Russian governor-general of Kyiv. In 1752 the Russian government designated areas of Serbian colonization on Zaporozhian territory—New Serbia in the northwest and Sloviano-Serbia in the northeast—and used the colonists to subdue the Cossacks. By the late 17th century a unique sociopolitical order had evolved in the Zaporizhia; with certain changes, it existed until the end of the 18th century. The order was based on the political equality of all Zaporozhian Cossacks regardless of their social origins. The principle of general elections was applied to all representative bodies, including the supreme Sich Council, the central administrative body, known as the Kish of the Zaporozhian Sich, the Kish otaman and his starshyna (the Kish judge, chancellor, osaul, and quartermaster), and the otamans of the Zaporozhian kurins. Those elected figures constituted the Council of Officers, a collegial administrative body. Outside the Sich appointed colonels commanded districts called palankas (eight in the 18th century). At the Sich the Zaporozhian Host (army) was traditionally divided into 38 kurins (the number of kurins was actually higher, because several existed outside the Sich), each with several hundred Cossacks. Numerous homesteads (see Zymivnyk) on the territory of each palanka were inhabited by married Cossacks (since only unmarried Cossacks could dwell at the Sich) and peasants, who engaged in individual farming. Collective farming was undertaken by each kurin. Fishing, hunting, and cattle raising were the chief occupations in the Zaporizhia. Agriculture became particularly developed under its last otaman, Petro Kalnyshevsky (1765–75), when peasants were readily welcomed as free settlers. The Zaporizhia also played an important commercial role because of its location on the trade route from the Crimea to Poland, the Hetman state, and Russia. Although Zaporozhian society was originally egalitarian, by the mid-18th century a higher stratum of znatni or starshi tovaryshi (‘notable’ or ‘senior fellows’) had come into being. Most Cossack officers were elected from among them. The ‘fellows'’accumulated wealth on their zymivnyky and were able to hire both free peasants and Cossack helpers to work for them. The Cossacks and peasants did not constitute closed estates. Movement from one to the other was possible and was regulated by the Kish according to its military and war needs. In 1762 nearly 33,700 Cossacks and over 150,000 peasants lived on Zaporozhian territory. By the time it was abolished, over 200,000 peasants lived there. As a result of the stratification that occurred in the 18th century, there was frequent popular unrest among the commoners and even several uprisings (the largest in 1768). 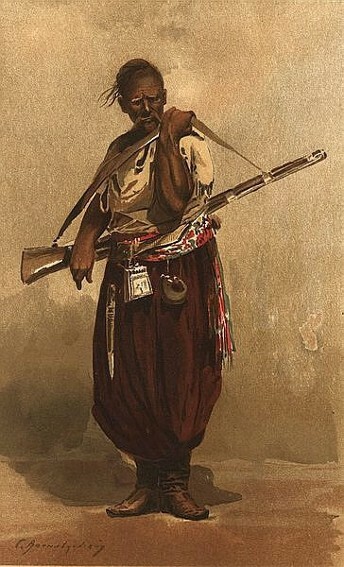 The Zaporizhia supported the haidamaka uprisings and the Koliivshchyna rebellion in Polish-ruled Ukraine; the rebellion was led by a Zaporozhian Cossack, Maksym Zalizniak. 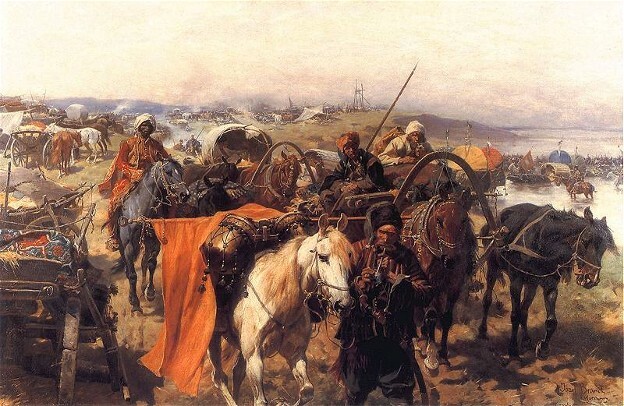 In the second half of the 18th century the Zaporozhian Cossacks were forced to struggle constantly against the encroachments of the mainly Serbian and Romanian colonists sponsored by the Russian government. The tsarist state increasingly limited the Zaporozhians' rights, freedoms, and self-government, particularly after the abolition of the Hetman state in 1764. On 15–16 June 1775, on orders from Catherine II, the Russian army under Gen P. Tekeli razed the New Sich. In her manifesto of 14 August 1775 Catherine officially abolished the Zaporozhian Host, calling it a ‘political monstrosity.’ Many of the Zaporozhians were forced into military settlements, and later became state peasants. Some 10,000 fled to Ottoman territory and founded the Danubian Sich there. From among those who remained under Russian rule the Boh Cossack Army and, later, the Black Sea Cossacks were formed. The lands of the Zaporizhia were incorporated into New Russia gubernia and Azov gubernia and distributed among the Russian and Ukrainian landowners.